How far back can you catalogue your family tree? Well at Malahide Castle and Gardens the history of the Talbot family dates back to as far as 1175 and is one of the oldest castles in Ireland, set on 260 acres, this magnificent & historic castle was home to the Talbot family for over 800 years. 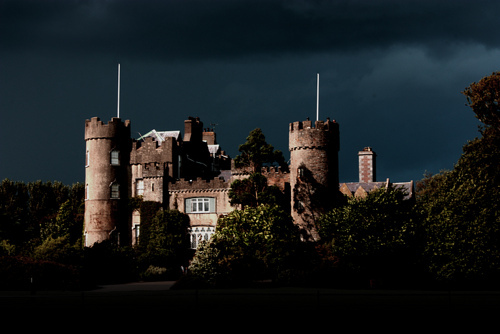 Malahide Castle has a long and rich history and played a central role in Medieval Irish history. The oldest parts of the castle date back to the 12th century. The building was notably enlarged in the reign of Edward IV, and the towers added circa 1600-1650. The estate survived such losses as the Battle of the Boyne and the Penal Laws. It was home to the Talbot family for almost 800 years (1185 to 1975). Malahide Castle was built by the Talbots, an English family holding the title Earls of Shrewsbury, who had arrived in England during the Norman invasion with William the Conqueror. The French origin of the name was Tailbois or Talebot, and they had been Barons of Cleuville in Normandy before their arrival in England. Their name is thought to be first recorded in the Domesday Book of 1086. Richard Talbot arrived in Ireland in 1174, and in 1185 he was granted the lands and harbour of Malahide by Henry II for his “war-like” services in the Anglo-Norman conquest of Ireland. With the exception of a short time during the Cromwellian period the Talbot family resided in Malahide for the next eight centuries. Their first stronghold was possibly a Motte and bailey castle, the earthwork remains of a Motte survive at Wheatfields southeast of Malahide, before a stone castle was built on the site of the current Malahide Castle. The family had an established coat of arms by the 14th century bearing a lion and a hound. Their motto “Forte-et-Fidele”, Brave and Faithful, would appear to refer to the lion and hound respectively. The Talbots are reputed to have been a diplomatic family, carefully manoeuvring between the authority of church and state and during the eight centuries between 1185 and the 1970s, their tenure at Malahide Castle was only broken for a brief interlude between 1649 and 1660 when their lands were seized by Cromwellian soldiers and the castle was occupied by Myles Corbet, Lord Chief Baron of Ireland. Although the Talbots had taken the Jacobite side, their land holdings were not confiscated after The Battle of the Boynein 1690. Fourteen members of the Talbot family, who had breakfasted together on the morning of the battle in the Great Hall of Malahide Castle, died at the Boyne. In 1831 the Talbots were again raised to the peerage with the title Baron Talbot of Malahide. The Talbots leave an extraordinary legacy in Malahide and beyond. Among the family members were noted statesmen, churchmen and scholars and one great member of the family, Sir John Talbot known as Lord Furnival, was immortalized in Shakespeare’s play ‘Henry VI’. Thirty individual Talbots had their seat at Malahide, from the first Lord Richard Talbot to Lord Milo Talbot, the 7th Baron, who died in 1973. Malahide Castle and Demesne was eventually inherited by the seventh Baron Talbot and on his death in 1973, passed to his sister, Rose. In 1975, Rose sold the castle to the Irish State, partly to fund inheritance taxes. Many of the contents, notably furnishings, of the castle, had been sold in advance, leading to considerable public controversy, but private and governmental parties were able to retrieve some. Rose Talbot, one of the last surviving members of the Talbot family died at Malahide House, Tasmania in 2009. Her closest relatives, who married into the German surname Dietsch, traveled to Canada and the United States of America. Members of the Dietsch family still live in the USA and Canada today. Richard Talbot came with Henry II to Ireland in 1174 and was given the grant of Malahide. In 1286, a further Richard de Talbot, grandson of the original grantee, granted all lordships, escheats, reliefs and marriages to King Edward and settled the manor of Malahide on his son, Milo. In 1315, Richard of Malahide served as a Sherriff of Dublin and had some involvement in the wars against Edward Bruce of Scotland. In 1389 (Book of Howth) John Bermingham, Earl of Louth, and other Berminghams and Richard Talbot of Malahide and eleven others were slain by the Vernons and Gernons of Uriel during a banquet. Thomas Talbot was granted a patent of privileges as dominus de Malahide by the crown in 1469. King Edward IV in 1476, granting him all the customs of merchandise brought into the port of Malahide and the rank of Admiral of that port for himself and his heirs. Little is known of castle’s appearance or existence in Middle Ages. One of earliest references is from 1534 during rebellion of Silken Thomas (10th Earl of Kildare). The O’Tooles and O’Byrnes of Wicklow marched on Malahide where ‘they burst open the gates till they came to the Hall doors where they were resisted with great difficulty’. During The 17th century was a period of considerable disruption at Malahide, with the family losing possession of the castle and estate for a brief period in the middle of the century. In 1639 Lord Stafford attempted to wrest the Castle from the Talbots, take control of the port of Malahide and the right to claim customs on goods landed there. Then during the 1641 Irish Rebellion the Earl of Ormond seized Malahide and stationed a garrison of 200 men there as a defence against the Confederate rebels. In 1661, the King restored James to his estates and his outlawry was pardoned. On the eve of the Battle of the Boyne, 1 July 1690, fourteen members of the extended Talbot clan are said to have sat down to breakfast at Malahide in the Great Hall (but it could have been in another room). Only one of the fourteen cousins returned. In 1825, the castle was let to Marquess Wellesley, Lord Lieutenant of Ireland and brother of the Duke of Wellington, as a summer residence. The date when the Talbots moved to the site of the Malahide Castle is not known, but it would appear to have been c. 1250. The earliest documentary reference to the castle is thought to be at the top of a patent granted by Edward IV to Sir Thomas Talbot in 1486, bearing a sketch of the castle. This consisted of a three storey keep-like tower, the east side of the present castle, probably dating to the 1400s, extended c. 1475. The long western wing was added in the period 1550 to 1640, along with additions to the north east. In the 1640s Myles Corbet was attracted to the castle as it was, “the strongest Castle in the neighbourhood of Dublin”. The drawing rooms were reconstructed between 1765 and 1782 after a fire in the west wing of the building, and two circular corner turrets were added in picturesque Gothic Revival style. In the early 19th century the projecting square turreted entrance portion was added, along with lower blocks enclosing the rear entrance court. Milo the 7th Lord Talbot de Malahide carried out some modernising alterations to the castle after his retirement from British Diplomatic Service. He also created the Talbot Botanic Garden after inheriting property in 1948.